The King’s Port Inn in Kennebunkport Maine offers 33 handsomely designed guest rooms and suites in the heart of Kennebunkport’s famous seaside village and just steps from Dock Square with its unique boutique shops, galleries, restaurants and marinas. Bathrooms with marble tiled floors. Rooms with CCTV, air-conditioning, voice mail, dataport and hair dryers. Some rooms offer a 4-Poster bed and/or two-person Marble Jacuzzis Tub with dual showers. A few rooms with Gas Fireplaces. 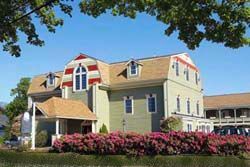 This and other Kennebunkport Bed and Breakfast Inns can be found here in The Register.